Drama. The Dow Theory was flashing “buy” in July on the conjunction of new highs for both the industrials and the transports but by then the Perpetual Bond™ was already fully loaded except for JetBlue which we began buying in September (The Wall Street Journal, July 18, 2013, Dow Theory Flashes ‘Buy,’ As Transports, Industrials Hit New Highs). 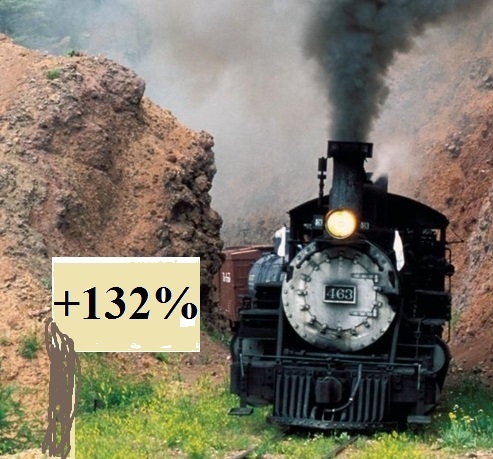 We met them all at the pass and the leveraged portfolio is now up +132% this year and the cash only portfolio is up +54%. Plus dividends that averaged 1.7%. Please see Exhibit 3 and 4 below for more details. The big issue for us is how to protect the prices that we have which are up an average of +45% since December. 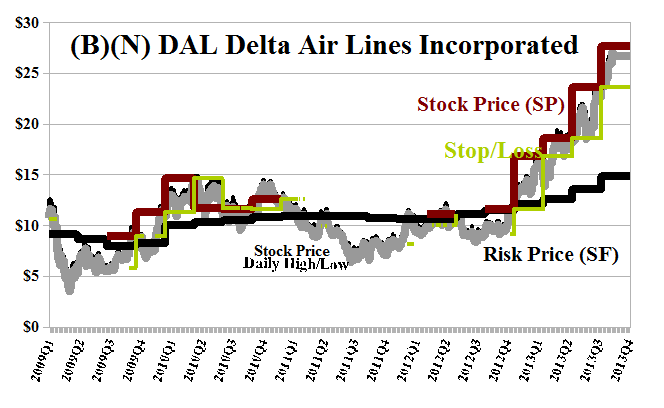 We can afford the stop/loss at minus (9%) if the entire market swoons (please see Exhibit 3 below and an example in Exhibit 1 for Delta Air Lines) but there’s also plenty of opportunity to buy puts against our long position and we can do that with the dividends already earned or take some profits by selling a few shares to protect the rest. That’s the hardest decision all year. In aggregate, we made only eight buy/sell decisions for the transports this year and none of them has been a sell (please see Exhibit 3 below for (B)- to (N)-transitions indicating a sell and the reverse (N) to (B) for a buy). The fundamentals (Exhibit 2 below) look like random numbers and don’t help us at all and we’re committed to buying and holding anything and everything that’s trading at or above the “price of risk” and for no other reason. It doesn’t matter to us, for example, that UPS United Parcel Service is trading at 231× earnings and is up +28% this year; or that Delta Air Lines is up +122% this year but still “undervalued” at 11× earnings. It’s also disturbing that an industry that is as heavily “mortgaged” with debt more than twice the equity can afford to return nearly half of its earnings to the shareholders. Possibly they could issue some new stock to satisfy the appetite for it. In any case, we have no idea what the market will do next. The economics of transport, especially the airlines, is complicated and evidently the investor rules can change from company to company even in the same business. In contrast, the “price of risk” is an invariant. 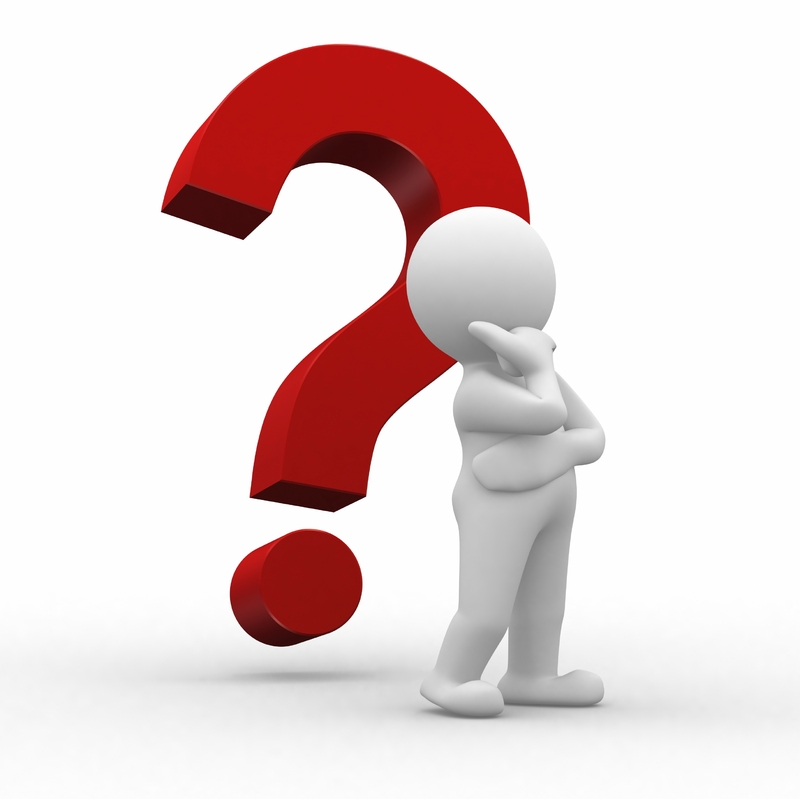 Its very meaning is tied to the bottom-line of any investment decision: are we likely to lose our money and if not, can we expect to make some? When a stock price appears to be “unhooked” from that idea, we just “buckle up” because we know that we have to.